Its hard to think of a more perfect location to live within London than the gorgeous streets of Marylebone. Restaurants, cafes, shops and bars all just metres outside of your front door and only a gentle stroll for you and your dog to Regents Park. If you’re lucky enough to live in Marylebone and are searching for a doggy daycare to take care of your best friend while you are out during the weekdays- Buddies have got your back! We cover the entire W1H, W1U & W1G Marylebone area for our dog and puppy daycare service. Your dog will have the time of their life with us! They will get to spend the whole day running in the meadows, paddling in the pools or playing hide and seek in the tractor tyres at our 16 acre dog day care centre! Our set up provides your dog with regular exercise and socialization, keeping them happy and healthy. 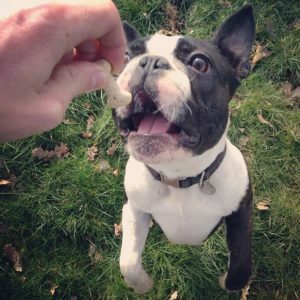 So you can have complete peace of mind; knowing that your dog is getting the care, stimulation and fun they need every weekday- making owning a dog in London that little bit easier! Our team at Buddies work really hard to give puppies the best start in life. We have a dedicated supervisor to watch over them and monitor their progress. We also work closely with trainers to focus on specific things to aid their development and we can also flag things up early on that we can help owners work on before they become a major issue. All this takes place in a fun and sociable setting, purpose built to be enriching and stimulating for them! We have playground equipment perfect for puppies, a wide range of toys, mini splash pools, tree trunks and shady rest zones. Split between indoor and outdoor areas- with pups always able to choose where they want to play, we are confident there is no better place for them to begin their exciting lives! Courtney already had a wealth of experience caring for dogs before she joined Buddies, and was excited to make it her full time career and escape the desk job life. Our most central London route, Courtney covers Fitzrovia and Marylebone whisking dogs from busy streets to countryside heaven! I don’t know what I’d do without Buddies Doggy Day Care. Arthur has been going there since he was puppy, and loves his days in the country at puppy day care. He also boards when I have to go away for work. It’s great to know that he’s being well cared for and having fun with his buddies whilst I’m at work, he comes back ready to snooze in his bed – quite an achievement by the team! Buddies Doggy Day Care provide a professional, reliable, trustworthy, yet personable service – we love them.